I have two new bows up for sale, Bill and Thwap! (because that’s the sound it makes). This latest run of work still maintains a focus on the natural beauty of the wood, however, instead of using exotic woods like bacote, bubinga, cocobolo, or rosewood, all of which come from tropical environments and are becoming somewhat scarce, I decided to focus on domestic woods which are in great abundance here in The United States. I have nothing against using exotic woods, but I wanted to prove that the wood I so often admire in furniture, can be just as beautiful in a bow as anything flashy and exotic. Bill, which has a buffalo horn riser (see what I did there? ), is made of American Curly Maple with Cherry limbs, while Thwap! is made from a beautiful piece of Cherry, with Maple limbs. Both have fiberglass backing and buffalo horn nocks for strength. Expect more of these domesticated bows in the future! My most recent recurve, BowCote, is finished. It's the newest bow in a line focused on the simplicity and beauty of the wood from which they're made. BowCote's riser wood, as the name suggests, is Bacote, a South American tropical hardwood with inimitable grain and character. It's that character that I want to speak for itself, which is why I left the riser simple, as one solid piece with no additional strips or accents, the only deviation being the brass medallion with the Brooklyln Bowyer logo. It shoots 40# @ 28" with an AMO of 62" making it a smooth shooter with almost no stacking. 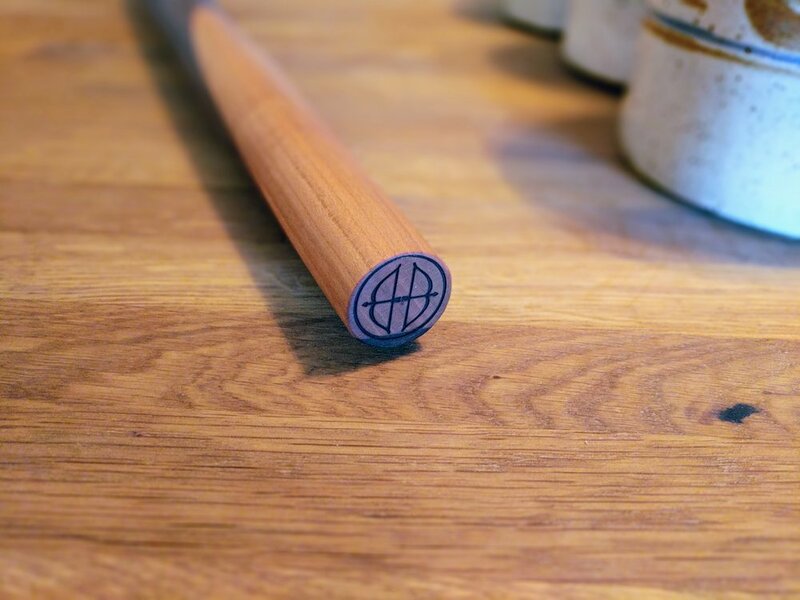 I've made a limited number of French Rolling Pins which can be purchased here. These beautiful handcrafted rolling pins are made from a stunning combination of domestic black walnut between maple and cherry. Each pin is turned individually by me and finished with a homemade beeswax/mineral oil rub to ensure food safety. Expert chefs know a french rolling pin far superior to their counterparts in function. My pins have an imperceptible flat portion in the middle with long tapers that make them particularly maneuverable over the table. Each pin is 20" long. I only make these every once in a while so if I sell out, please feel free to let me know you're interested in my next batch. I've made a limited run of Spalted Maple Coasters which can be purchased here. The spalting process happens in nature only under very specific circumstances and even when it does occur, it can take months or years to finish. The result of spalting is incredibly beautiful pigmentation and delineation throughout the wood. For all these reasons, it's highly coveted and sought after. All this being said, it's an incredibly fine piece of wood and this is the ONLY time you'll ever want to set your drink down on a piece of spalted maple. These coasters were all cut from the same limb, and sanded smooth by hand, then finished with multiple light coats of high quality wood finish, making them very water resistant but without that plastic-y look you see on some wood. Because the purpose of the coaster is to protect whatever is under it, I've lined each one with a thin layer of cork, as wood has the potential to scratch other wood and wood finishes. Each set comes with 4 coasters. Here's a slightly different take on my woven leather barstool. This one's got a mid-back leather strap and blonde wood to contrast the dark brown leather. I can make these in whatever kind of wood you'd like. Contact me for details. Dan wanted both his feet and the stool they rest on to be equal in beauty. Maybe I succeeded... maybe I didn't. Wiley represents my foray into the world of fiberglass recurve bows after having spent so much time and energy making all-wood bows. While I personally would rather make and shoot wooden-limbed bows, there is a certain utility in fiberglass limbs, not to mention a market. I have to admit, I very much missed the time and attention that goes into tillering the limbs of a wooden bow. The hours spent making sure the limbs bend just so and and just the right draw weight lend themselves to a feeling of connection to and ownership of the bow. It isn't to say that feeling isn't there with a fiberglass bow--the time I would have spent manually shaving off minuscule amounts of wood and then checking the tiller and repeating until the job is done was rather spent prepping with great precision all the parts that go into a recurve glue-up. And there is something magical about a glue-up done right, as the bow comes out of the form perfectly tillered (at hopefully close to the weight for which you were aiming). Luckily, my favorite part of bowyering, sculpting the wooden riser, is unchanged with fiberglass bows. There's certainly no less work in a recurve, however it's more work of the mind rather than muscle. I wonder if I'll ever get used to the feeling of completing a bow without sore muscles. The newest addition to the collection and up for sale now is Mrs. Rabbit. This one is an Osage Orange reflex-deflex longbow, backed with Hickory. The riser, which I chose to contour more than most, gives a sense of familiarity for easier consistency of hand placement shot to shot. The red Paduak wood is stunning. So much so that my camera has a hard time not auto adjusting to the point where the colors look hyper-saturated (even for this colorblind guy). I did something new on the tips in that I shaped the buffalo horn into an ever-so-slight recurve, with small grooves down the belly for the string. I also narrowed the material on the ends of the limbs to a bare minimum. That in combination with the reflex and the natural superiority of Osage Orange make this bow a fast shooter, despite it's low draw weight. All this to say: I'm very pleased with how Mrs. Rabbit turned out. A custom shelf that does more, or: I'm obsessed with magnets and leather! I recently made a custom shelving unit for a friend who simply needed her microwave above her stove and not on her counter. Originally it was just going to have one board going across the bottom, but then I thought "Well that's boring." I want it to DO MORE. There would have been so much space above the microwave, so I thought "What a great place for a butcher's block!" So I made an end-grain butcher's block out of all the scraps I had sitting around my shop. But how to easily slide such a monster in and out of the shelf? Why not a leather strap? Great idea! I love incorporating wood and leather... so I did. Now it looks like a butcher's block suitcase. I'm okay with that. But now there's all this boring un-utilized space below the shelf. How about a handy little spice rack made of tiny jars? Great idea! Should I sink the top into the shelf and secure it with epoxy? But won't it be a hassle to have to unscrew the jar every time you want to remove it? Good point. Magnets...? I do love magnets... I'm somewhat obsessed with magnets... Magnets it is! I sunk seven rare earth magnets into the shelf so the jars attached securely and easily from below. Let's stop there. I don't want to overdo it. Listen to me on NPR! The New Yorker Radio Hour just did a short piece on archery and took the time to interview me about my bows. It's a great funny piece by Patricia Marx. Listen here or download the podcast here. Another batch of live edge solid cherry wood magnetic knife racks is finished and ready to be shipped out! These are slightly taller than most and all are at least 24.5 inches long, holding 16 knifes comfortably. Contact me to purchase or for more info. It rhymes so you know it's true. FINISHED. It took a good long while, but it's finally done and I'm very happy with the way it turned out. It's walnut with a woven leather seat and I made it entirely using hand tools. I'll DEFINITELY be plugging in for its companion stool.